A great thing happens on the hills overlooking my town in early June. The lady’s slippers blossom. These ‘slipper’ or lung shaped orchids grow wild here. Years of avid lady’s slipper appreciation has made them almost extinct. They are now protected under the Endangered Species Act. But in the mid 1800’s they grew outside many a potter’s door. 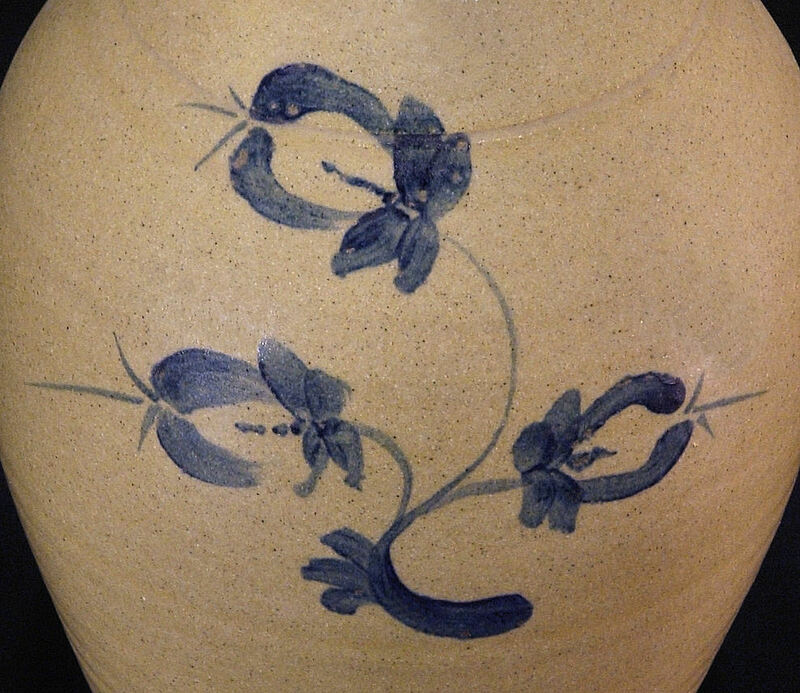 They were a favorite of the stoneware slip decorators. Or maybe they were just a safe bet. But flowers were safe. Lady’s slippers were (and are) a visually distinct form, masterfully executed by various decorators whose names are now forgotten. Mostly. The Smith Pottery in Norwalk, CT, employed a man named Chichester who’s slip trailed penmanship was renowned. And it wasn’t uncommon for potters to employ their daughters as decorators. Trailing tools could be passed down to next in line when a girl ‘reached age.’ Some even hold that Maria Crafts Kellog, niece of Thomas Crafts, only decorated jugs and crocks made in Whately MA (because “women didn’t make pottery…”). Another “in house” arrangement was to own the decorators. Many southern plantation potteries employed male slaves for throwers and female slaves for decorators. The plantation owner was the ‘potter’ – he owned the pottery. In other parts, itinerant decorators might have followed itinerant throwers. As late as the 1930’s vagrant throwers stayed long enough to fill the shop, earn enough to buy a bottle, and move on. I’ve only seen passing mention of itinerant decorators. But their existence can be inferred in the uniformity of design on pots from a variety of places. Of all the possible decorating methods, I feel the itinerant slippers present the most intimate definition of genuine folk art expression. Something spanning time and space. I like that image. American Stonewares. Georgeanna Greer. American Stonewares. Schiffer Publishing Ltd./Exton, PA. 1981. A Guide to Whately Potters. Henry Baldwin. Paradise Copies/Northampton, MA. 1999. Turners and Burners, the Folk Potters of North Carolina. Terry Zug. University of North Carolina Press/Chapel Hill, NC. 1986. Raised in Clay. Nancy Sweezy. Smithsonian Institution Press/Washington DC. 1984. You are currently browsing the archives for the Slave Potters category.